The item Immortal : love stories with bite, (ebook) represents a specific, individual, material embodiment of a distinct intellectual or artistic creation found in Charlotte Mecklenburg Library. Vampire stories from New York Times-bestselling and award-winning authors! 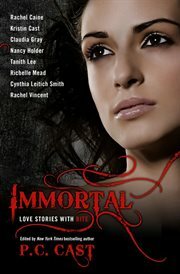 In Immortal: Love Stories with Bite, edited by New York Times-bestselling author of the House of Night series P. C. Cast, an all-star lineup of today's most popular authors offer new short stories that prove when you're immortal, true love really is forever. Rachel Caine revisits the setting of her popular Morganville Vampires series, where the vampires are in charge and love is a risky endeavor, even when it comes to your own family. Cynthia Leitich Smith, author of Tantalize, gives us a love triangle between a vampire, a ghost and a human girl, in which none are who, or what, they seem. Claudia Gray takes us into the world of her Evernight series, in which a pre-Civil War courtesan-to-be is courted by a pale, fair-haired man whose attentions are too dangerous to spurn, in more ways than one. Richelle Mead, author of the Vampire Academy series, brings us the tale of a young vampire on the run from the rest of her kind, and the human boy who provides the getaway car-as well as a reason to keep running. Nancy Holder, known for the Wicked series and her Buffy the Vampire Slayer novels, immerses us in a post-apocalyptic New York where two best friends are forced to make a choice that may kill them both. Kristin Cast, coauthor of the House of Night series, introduces us to a new kind of vampire: one with roots in Greek mythology, and the power to alter space and time to save the girl he's meant to love. Rachel Vincent explores a new corner of her Soul Screamers series with the story of a leannǹ sd̕he capable of inspiring the musician she loves to new creative heights, or draining him, and his talent, dry. And Tanith Lee, author of Black Unicorn, shows us what happens when a bright young woman with some supernatural savvy encounters a misguided (but gorgeous) young vampire..